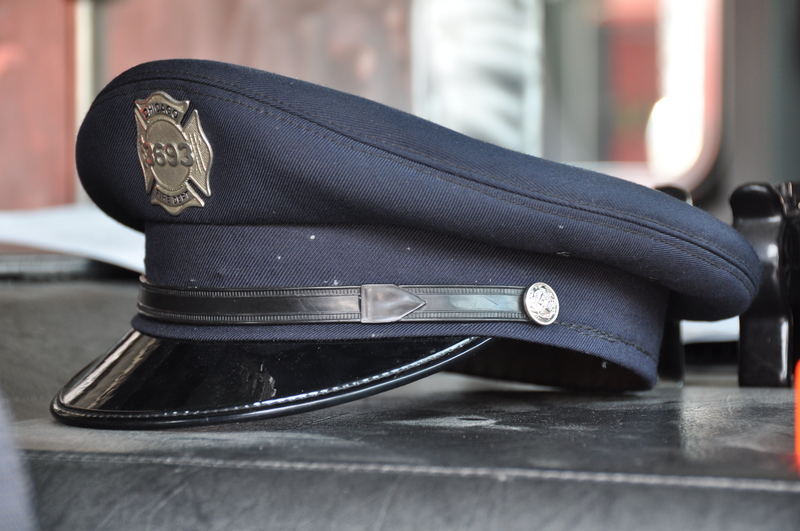 A Chicago fireman’s class “A” uniform cap sits on the dash of a ladder truck. Steve Cohen, the President of Lighthouse Uniform Company, is the creator of the 9/11 Commemorative Chin Strap which features a red bloodline down the middle of the black, white or gold chin straps normally worn on the dress cap. As we are approaching the 10th anniversary of the 9/11 attacks, the Lighthouse has partnered with State Fire Department Associations and donates $5 for every strap sold in that state to the association. His hope is that all of the hundreds of thousands of firefighters who take part in events commemorating the 10-year anniversary of the 9/11 terrorist attacks will be wearing the 9/11 Commemorative Chin Straps. In the photo above the chinstrap is the black leather band that sits just above the brim which is attached to the cap on both sides with a button. Click here for more information on the 9/11 commemorative chin strap. This entry was posted in A Fallen Hero, Chicago, Fire Department, Firefighters, Life and tagged 9/11 commemorative chin strap, Firefighter Class "A" uniform cap, Lighthouse Uniform Company, Steve Cohen. Bookmark the permalink.